To get the full experience of premium, high-quality flooring, the installation has to be as outstanding as the flooring materials you’ve selected. Otherwise, your flooring will be susceptible to abnormal gaps, buckling, and irregularities in appearance. At Freedom Flooring, we want every single client we serve to enjoy maximum longevity and durability when they invest in new flooring for their space. That’s why we hire trained and qualified flooring installers in Edmonton, who take great pride in their craft. Whether it’s carpet, laminate, vinyl, or hardwood, our installation specialists are equipped and prepared to complete your project, providing a finished product that is high-calibre and long-lasting. Above all else, we prioritize completing all projects in a safe manner, while adhering to deadlines and upholding our strict standards of service. If you’re looking for flooring installation services in Edmonton, Alberta, make Freedom Flooring your first choice. We’re confident our top-of-the-line flooring selections, along with our meticulous installation process, will surpass your expectations. 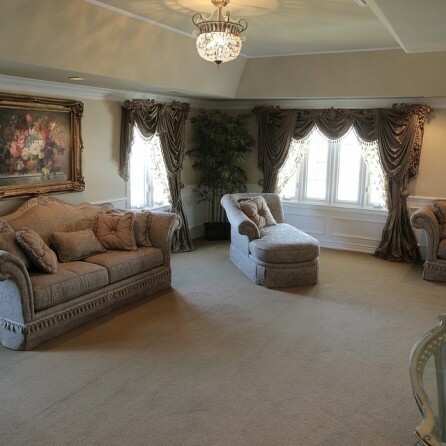 When booking your Edmonton carpet installation with us, it’s important to ensure your space is ready. By following these simple steps, you can assist our installation specialists and provide them with the ideal environment to complete your project. If your space is decorated with valuable art, breakable ornaments, or priceless family heirlooms, it’s best to remove them before our carpet installers arrive. We want to reduce the likelihood of an accident as much as possible, so the more clear and uncluttered your space is, the less the possibility of damage is of concern. Unfortunately, our Edmonton carpet installers are not professional movers. Thus, we do require that you arrange for the removal of any major pieces of furniture or any heavy appliances that could interfere with the installation process. Our installation specialists need these items to be vacated in order to complete your project on time and deliver your desired outcome. Your help is greatly appreciated! During the installation process, it is possible that your carpet installation specialist will need to contact you. In some cases, your installer may notice that your subfloor needs to be replaced, or realize that the temperature or moisture level in your home is not ideal for installation. When concerns like these arise, it’s imperative that your installation expert be able to reach you to discuss the best course of action moving forward. So, if you can’t be available on-site, providing a cell phone number where you can be reached is recommended. HOW LONG DOES CARPET INSTALLATION TAKE? At Freedom Flooring, we understand that life gets busy, and that having your homelife or business operations disrupted is less-than-ideal. So, we make every effort to complete your flooring installation as quickly and as seamlessly as possible. Typically, our team can lay approximately 14 meters of carpet (including subflooring) in an hour. Of course, timing can be affected by the size and shape of your room, unexpected issues, or how difficult it is to remove your previous flooring. Ultimately, we want to provide our clients with an impeccable installation, so they can enjoy their finished product for years to come. We believe that a rushed job is rarely a success. So, we always appreciate your understanding if we require a little extra time to ensure you receive the quality you deserve. CAN FREEDOM FLOORING ADVISE ME ON WHICH CARPET TYPE IS BEST FOR ME? Absolutely. Our knowledgeable carpet installers are always available to answer your questions and recommend the best solution for you. Whether you are pet owner who needs a carpet with more durable fibres, or you’re looking for a plush-pile carpet to bring comfort and softness to your bedrooms, our Edmonton carpet installers will help you find flooring to fit your vision. HOW DOES FREEDOM FLOORING GUARANTEE THEIR WORK? We offer a 1 year installation warranty on all flooring projects. Should any defects or issues arise during this time, our Edmonton flooring installers will correct them free of charge. It is important to note, however, that installation warranties do not cover damage that arise from neglect, abuse, or cleaning treatments performed by homeowners. As always, it is our priority to provide all clients with a premium, high-quality installation the first time—eliminating the need for additional touch ups or fixes. Our Edmonton flooring installers have over 50 years of combined work experience? It’s true. We come to every job armed with in-depth industry knowledge and the practical, hands-on skills required to provide you with long-lasting flooring you can enjoy for years to come.